Did you make any New Year's resolutions? Have you broken them yet? 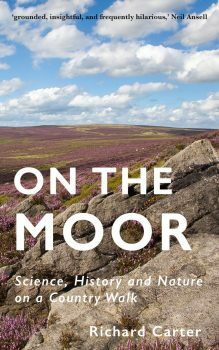 High on my list of other stuff to get out there early(ish) this year is my book On the Moor. Of which, more, no doubt, in future newsletters. (Audio, 49 mins) WNPR Connecticut’s Colin McEnroe interviews the always-entertaining Patti Smith. (Video, 2 mins) David Shiyang Liu’s animation of an inspirational two-minute ad lib by Ira Glass on how, in the early days of your creative endeavours, you shouldn’t be discouraged when your taste exceeds your talent. Prof. Steven Nadler’s explains why the seventeenth-century Dutch Jewish philosopher Spinosa still matters. (Video, 8 mins) Episode 97 in the excellent Objectivity history-of-science series explains how the UK and France finally succeeded in reconciling longitude measurements made from the rival Paris- and Greenwich-based meridians (a subject I also cover in my forthcoming book, On the Moor). Richard Mertens insists (not entirely convincingly) that he is NOT two toddlers in a trench coat. Philosopher Patrick Stokes argues there are some opinions that need to be justified, if they’re to be treated seriously. Astronomers have examined nearly 3,000 years of celestial records and concluded that Earth's days lengthen by two milliseconds a century. Meanwhile, other astronomers have estimated the universe has 20 times more galaxies than we thought. Like something out of Jurassic Park, palaeontologists have described a dinosaur tail preserved in amber. I have an article featuring lots of photos in the January 2017 edition of Dalesman magazine. It's about my photo-project and book Hebden's Other Bridges. Coincidentally, I've also been asked by those nice people at Caught by the River to put on a small exhibition of my bridges photos as part of their forthcoming Hebden Bridge poetry and prose event on 21st January. All the cool kids will be going. A magazine article, a photo-exhibition, a video slideshow, and a newsletter—all in January. I know I want to get stuff out there, but there’s a danger of peaking too soon! Feel free to contact me with any feedback. And please forward this newsletter to any friends you think might enjoy it, urging them to make a belated New Year's resolution to subscribe.